Brewster’s winning relay team, clockwise from top left: Courtney Monsees, Alexis Valedon, Ali Polhill, Kristi Edleson BREWSTER—Members of the Brewster High swim team turned in an impressive performance at the Section 1 championships, held… Please login below or purchase a subscription to the Putnam County Courier to access this content. Brewster’s Mike Thomas (L) and Charlie Carr led the Bears in 4th and 5th place at Bowdoin Park last Friday. BREWSTER—All season long, the Brewster High boys cross country team was aiming at one thing: a sectional championship. Last Frid… Please login below or purchase a subscription to the Putnam County Courier to access this content. Carmel High’s Marielle Campbell turned in a strong performance the state meet last week. CARMEL—Carmel High’s Marielle Campbell turned in a strong performance at the state tennis championship meet last week, losing her opener, then … Please login below or purchase a subscription to the Putnam County Courier to access this content. PV keeper Tianna Daley (99) makes a save on a ball heading toward net. 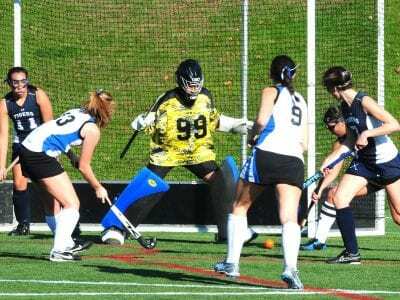 PUTNAM VALLEY—The Putnam Valley Tigers knew they were the underdogs in Sunday’s Class C field hockey championship game, but they sure didn’t play like it during … Please login below or purchase a subscription to the Putnam County Courier to access this content. MAHOPAC—Quarterback TJ Foley rushed for 85 yards and three touchdowns, and passed for two more scores, as the Mahopac High football team ripped Lincoln, 37-14, in a non-playoff game last Thursday at Mahopac. The Indians, who close the season… Please login below or purchase a subscription to the Putnam County Courier to access this content. Right: Olympic gold medal champion Isao Yoneda allows Green Chimneys students Roman and Hunter to try on his medals while colleague Mariko Ukiyo of Tokyo looks on. Photo by ERIC GROSS. 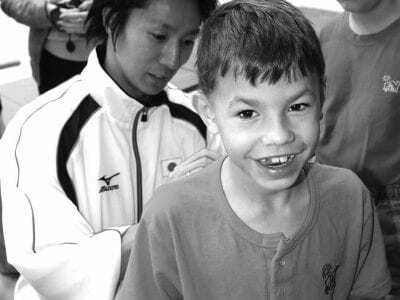 Students at Green Chimneys had a rare opportunity when 2004 Olym… Please login below or purchase a subscription to the Putnam County Courier to access this content. 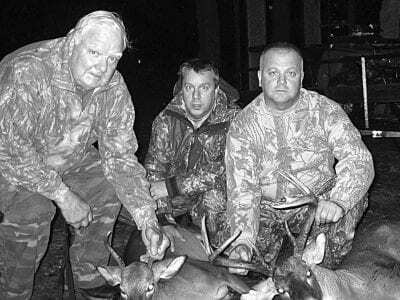 Mike McBride, from Lake Carmel, his Son, John, from Fishkill, and Kevin, also Lake Carmel, with Kevin’s 9 point, North Carolina buck taken last Monday at East Carolina Outfitter’s, from a tree stand at a tree stand overlooking one of the … Please login below or purchase a subscription to the Putnam County Courier to access this content. Christina Stefano 13 earned her Junior Black Belt at USA Karate located at the Patterson Recreation Center in Patterson New York . 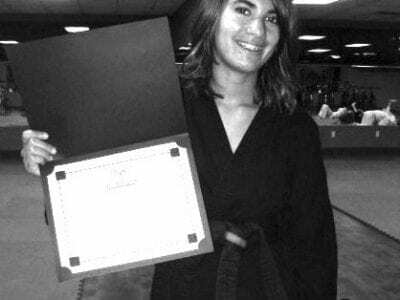 Christina Excelled at Karate, Kickboxing and Brazilian Jiu-jitsu. … Please login below or purchase a subscription to the Putnam County Courier to access this content. PUTNAM VALLEY—The Putnam Valley High boys and girls cross country teams competed in the class C sectional championship race on Friday in Bowdoin Park. The boys placed fifth out of 12 teams. “This was the first time we are ran in the cl… Please login below or purchase a subscription to the Putnam County Courier to access this content.